When you say comic, you are likely talking about Mikey, Pinky & Dave in The Deucecast Movie Show! 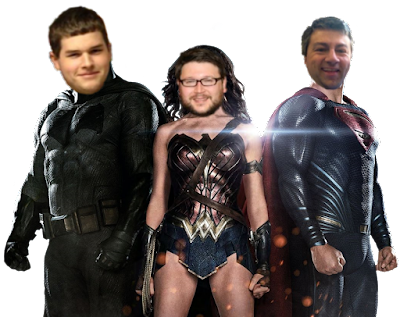 In fact, you can't say Deucecast without DC... even though the guys are more Marvel, they dive into DC Comic movies! Joining the group is Terrance Malick Apologist and Film Historian Dr Earl, aka, McDreamySteamy, and Friend of the Show, host of the Remodeling Clay podcast Clay Shaver. Up first are the birthday movies ("Bridget Jones Diary" is how old?? ), and then a new segment where the group is forced to discuss situations where Tom Cruise may never win an Academy Award... where Adam Sandler never gets his groove back, if he had a groove... or Avengers Infinity War makes a billion dollars and yet, isn't any good. Favorite DC Comic movies is the topic, and though there is a lot of Batman and Superman, there is also some Violence, some Perdition, a few Losers, a Vendetta, a Hornet.. and yes, Blue Junk. You'll also hear a callback to "Swordfish"... Mikey the Contrarian... and mentions of Jacquline Bisset, David Schwimmer as Superman AND a Plastic Man addition, though that might be a stretch. The first bit of discussion is spoiler free, just overall opinions... there is a warning given, then a dive into much deeper discussion, filled with spoilers. And you'll also get to hear the latest "Pretty in Pink"... find out what Pinky thinks of "The Lost Boys"